After an inspired performances by Hussey the previous day, which ensured Aussies always had a healthy lead of England there was no looking behind. The bowlers along where too stick to the test, who demolished and pulverised the England line up in a hurry. 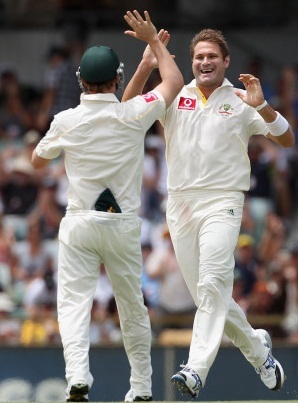 They were bundled out in just 10 overs starting on the fourth day at the WACA at 123. Resuming from 81-5 the previous day,with Bell and Anderson on the crease, Bell joined Anderson at the start of the play since Collingwood got out just before stumps the previous day. England batsman were of no clue how to let go , other than wickets kept on tumbling. Wasting absolutely no time they were able to secure a thumping 267- run victory as Harris was the cheif architect taking 6-47 to rip off the English batting line up.So this means we all shall be witnessing a cracker of a fifth test match which would decide the fate of 2010 Ashes series.By the victory it also was their first victory in six test, the previous one coming against Pakistan at Lords.This finally at the end ,acted as salvation for Ponting who has had a torrid time with his captaincy for quite some time now. He was not available on the field today due to his broken finger, but still brought him a perfect birthday gift on his 36th birthday. Man of the match was Mitchell Johnson who had inspired this amazing victory. With a topping half century in the first innings and 9-82 with his bowling, which meant it was a wise call by the selectors giving him a chance, and believed in his abilities. Aussies from being 5 for 69 on the first day this has been one of finest Test turnarounds in recent times and they'll take a huge surge of confidence into the next clash. However, both teams will remember that a similar momentum-shift occurred in 2009 when Australia won at Headingley before England secured the Ashes at The Oval. Despite the margin of victory in this, and the previous match, these two teams are closely matched and the series could turn into a classic.But still I believe that England has lost its momentum and the mental advantage they had gained by the previous matches.